Matt tells Hilary to face up to the fact that she's his mother or he's going back to Adelaide. When she refuses, he tells her there's nothing left for him in Erinsborough. Madge arrives at the party and tells Helen and Harold that the woman who is hoping to buy Number 24 coming again tomorrrow to see of there's room enough for another bathroom. Harold's pleased and thinks they will have the place sold in no time. Jim arrives with drinks and both Helen and Beverly take one. Henry asks Bronwyn how she is and she tells she's been worse. Jim tells Nick to go over to Joe's to get a tub to put the remaining beer in. As Nick leaves Paul and Gail arrive and are surprised to find they are not the last to arrive. Matt arrives and Helen asks whether Hilary will be here soon. Matt tells her he couldn't say and couldn't care less. Des and Jane are getting ready for the party as Jane muses she could learn a lot about kids from Mrs Kirkwood. Des asks her whether she realizes that they won't have much private time when they are looking after Jamie but Jane tells him she can handle it. She asks whether Mike will be at the party as she hasn't seen him all day but realizes he's not coming and Des has to tell her he's been missing for the past two days. His friends don't know where he is and the police can't help because when he told them why Mike left they told him it wasn't a police matter. Mike is going to have to realize that life is full of up's and down's and tells her that they didn't get together just to spite him; it was something that out of their control. Jane says she hates knowing he's so unhappy. They go to leave for the party but Des stops Jane saying he can't go yet because every girl that goes to an engagement party get a ring and he produces an engagement ring. Jane's touched and tells him it's perfect just like he is and loves him a lot. They kiss. Joe and Kerry are kissing but Kerry stops hom and says he can't win her over that easily. Joe tells her she's had him hanging on for months and she doesn't see Jane doing that to Des but Kerry points out he did it to her. She tells him she's got Sky to think about. She also says that she managed without a dad so far. Joe tells her he'd be good for her and with Noelene up north, Toby's going to need a woman around but Kerry's one step ahead of him because he thinks now that Jane's getting married he just wants a woman around to clean up after them. Joe tells her he loves her and Sky and wants the four of them to be a family. There a knock at the door and Kerry answers it to find Nick standing there. Joe, fuming at the interruption, demands to know what he wants. Nick tells he's come to get a tub for the beer and Kerry shows him to the laundry room leaving Joe fuming. JOE: A bloke would have to be nanas! Jim and Harold are in the kitchen as Harold complains that he has beetroot on his shirt. He tries to get the stuff off but fails and Jim tells him that Madge can get that out but Harold's doesn't seem to think so and thinks slat is the answer and as he puts the slat all over the shirt (!) Jim jokes whether he would like parsley & pepper with it! Harold is not amused that he's making joke out of him as usual. He tells Jim that he will almost be glad to leave because he's sick and tired of being the local bafoon! He lists his choir singing, his vegetarianism and his scouting as the reasons he gets ridiculed. Jim tells him that doesn't mean they don't respect his principles. He adds that without his commitment to the movement, a lot of young boys would have missed out. He them describes him as unique and the street will be the loser when he goes. 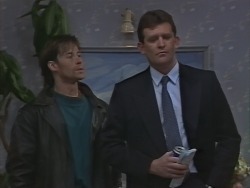 Nick arrives back with the crates and Jim asks him whether Joe and Kerry are on their way and Nick tells him that they were fighting about something when he left. Jim muses he wished they'd leave their personal problems at home. In the lounge room, Jane shows Helen, Gail, Paul, Beverly and Bronwyn her engagement ring. Bronwyn thinks Jane is the luckiest girl in the world and she used to work for him! Jane tells Bronwyn she might be next. Henry walks over and asks for a chat. He apologises for the way he's been acting and promises on Madge's head he won't be jealous of her at which point Madge interrupts them. Joe and Kerry come in and Joe says he knows that the party is for Des and Jane but says that he and Kerry have an announcement to make. JIM: Well go on and say it, I'm thisty! Joe tells everyone to drink to him and Kerry because they are getting Married too! Everyone's delighted except Harold who looks stunned. Harold is fuming that Kerry didn't tell him about the engagement first but Kerry tells him that they only decided themselves half an hour ago; the party seemed a good time to tell everyone. Harold softens and hugs her telling her that it's about time she and Sky had a family of their own. He adds that it will be hard to walk away and leave the both of them behind. Kerry that he'll be leaving Joe behind too! Jim congratulates Joe Whilst Sharon tells Nick and Bronwyn that with two weddings coming up she will be able to buy some new clothes as Bronwyn wonders who will be first up the aisle and asks Matt for his option. Matt tells the group he's going back to Adelaide the next and whilst Nick Jokes whether he can't stand the competition; Sharon seems to think it's because he's can't stand Hilary. Hilary pours herself a cup of tea as she tearfully tells herself she will not be blackmailed. Helen and Madge are in the kitchen as Helen wonders what trouble Hilary has stirred up now as Madge remembers her giving baby clothes to Scott and Charlene as a wedding present and they reminisce about past celebrations and that the next one will Madge and Harold's farewell. Helen starts to get tearful as she says she's going to miss Madge and they promise to write and ring. Harold comes in and tells them the speeches are about to start. Madge tells they were discussing their farewell and Harold they will have to far to surpass this party's efforts. In the lounge, Joe starts to make a speech and everyone gets uncomfortable when he mentions how long it took for Jane and Des to get together. Sharon begins to feel the speech is painful and heads off to go and get Hilary. 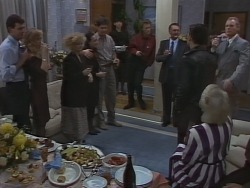 The speech finally ends when Joe proposes a toast to Des and Jane before asking Des to make a speech. Des curses himself for having to marry into the Mangel family! He begins his speech by saying that Jane is the most beautiful girl in the world. Jane smiles at him. Sharon is heading over to Number 30 when she notices Mike pulling up on his motorbike and asks him where he's been to which he replies grimly Around. He asks her what's going on and Sharon is forced to tell him it's a party for Des and Jane's engagement. MIKE: Maybe my invitation got lost in the mail but I wouldn't miss this for the world. He hands his helmet to Sharon and storms off inside. MIKE: Good friends are everything aren't they? Take Des, for instance. You know what I said at my 21st? He was always there whenever I needed him to see him through thick and thin. Des goes and stands next to Jane as Mike continues. MIKE: He's the one guy I could trust no matter what. And Jane, well. We all know what she meant to me. So let's drink to them. They deserve each other. As he down a beer, Jane glares bitterly at him whilst Des comforts her. Mike storms into the house closely followed by a fuming Jim who tells him that that was one hell of performance he put on back there and that it was supposed to be a happy occasion for Des and Jane before accusing him of wrecking it. Mike however is unrepentant and snaps at him to go back to the happy couple. A furious looking Jim snaps back that if Des and Jane are happy it's no thanks to him before storming out bumping into Bronwyn on the way out. She tries another approach and tells him she's come to keep him company. Henry wants to go after Bronwyn but Joe and Kerry stop him saying that now he's told her wouldn't be jealous he's got to prove it. Looking depressed Henry heads over to get some food. Paul decides to liven things up a bit with some music but Harold doesn't seem impressed. Sharon comes back in and Helen asks her whether Hilary's coming over and Sharon tells her she pratically bit her head off when she asked. Beverly decides to go and check on her and leaves. Sharon asks Gail for details on what happened. GAIL: Well I could cheerfully murder Mike you should have seen the look on poor Jane's face. She goes to check on her but Helen stops her telling to leave it to Des. In the laundry room, Des is furious that Mike carried on like a spoilt brat whilst Jane is upset that they so be so happy with Mike so miserable. Des hugs her and tells her Mike's come unstuck a bit; he'll get over it. He adds that he figures out this much; they love each other and he's not going to let it spoil it for them not even Mike. Bronwyn hands Mike a cup of tea as he tells her he loved Jane so much and thought he could get her back; he trusted Des and he helped himself. Bronwyn doesn't think it was like that and says that Des and Jane didn't mean to hurt him; Jane's felt strongly about Des for ages and probably got Des thinking about her. Mike snaps that the two people he cares about have both shut him out and it feels scary. It's like he's got no one left. Bronwyn asks him whether he's being paranoid to which Mike replies that she saw how Jim carried on. He's not going to have a friend left after his performance. Bronwyn tells he'll still have her and comforts him. 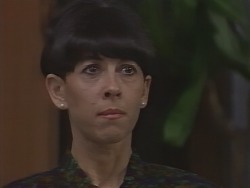 Hilary opens the back door to find Beverly standing who asks her whether she's alright as she's been knocking for ages. She tells she's fine and has changed her mind about going to the party. Beverly's surprised and they leave. Madge notices the quiet atmosphere following Mike's performance so Jim decides to reawaken things with a speech. He thanks everyone who organised the food including Harold and Paul for the drinks. He then proposes a toast to Des and Jane, “every happiness.” Everyone raises their glasses. 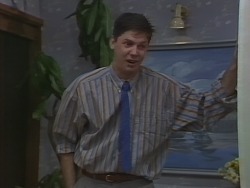 Jim realizes he forgot Joe and Kerry's engagement and also does a toast to them as Beverly and Hilary come in at which point he remembers that Matt is leaving Ramsay Street and then also proposes a toast to him. He then says that's just about it. She goes over and stands next to Matt as she announces that she gathers it's been a night of announcements so she has one of her own. Jim asks whether it could wait but Hilary tells him it's waited far too long already. HILARY: You all know Matthew as the son of friends of mine in Adelaide. Well, I'm afraid I've misinformed you. He is in fact my own son, Matthew Robinson. Everyone is shocked and Sharon starts to ask for details, which Hilary refuses to give. Hliary asks Matt whether it puts paid to him leaving to which he replies it does and call her “Mum” as he thanks her. A speechless Helen welcomes him into the family as does Paul. JIM: Well I don't there much more for me to add. Except to say that nobody throws a party quite like Ramsay Street! Everyone agrees and they raise their glasses again and gives three cheers as Matt and Hilary share their first hug as mother and son.